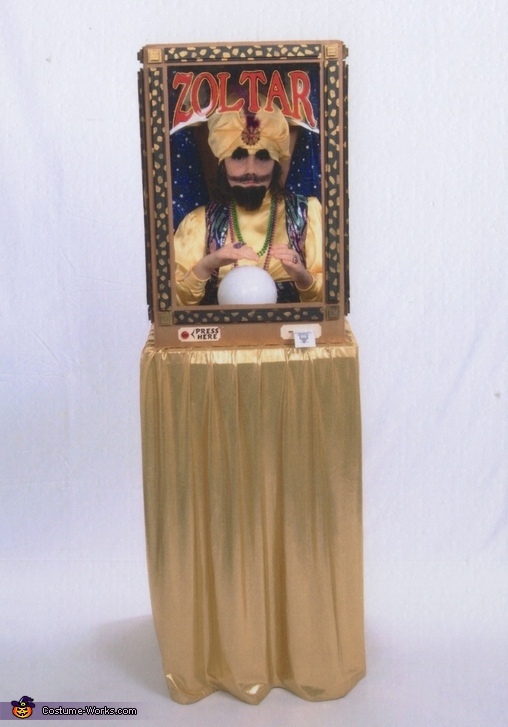 We came across one of these classic fortune teller machines while on a family vacation and our oldest daughter thought it would be fun to dress as one for Halloween. My wife and I have a standing Halloween costume policy that as long as the kids come up with an interesting and original idea then we'll do our best to build it for them. The base of the costume started with a square of 4" green upholstery foam. Into this we cut a small hole just large enough for our daughter to squeeze into. This needed to be snug because it would serve as the main support for the completed costume. On top of this foam we cut a square of rigid, 1" foam insulation. This served as the platform for the box to sit on. to this layer we also attached a gold fabric skirt/table cloth to hide our daughter's legs. To marry all the layers together we first added 4 3/4" PVC legs to the corners of the box which extended about 6" past the bottom of the box. Then in the layers of foam, we cut holes large enough for the PVC legs to pass through. When assembled, the construction was remarkably stable and secure. We didn't need or use any other form of attachment. For the Fortune teller costume, we made our daughter a gold, puffy shirt and matching turban and sparkly, purple vest and cummerbund. She then added a few strings of those plastic mardi gras beads and some costume jewelry rings. Next we made for her a fake goatee, mustache, eyebrow and sideburns which were applied with toupee tape to make removal simpler. To finish off the look we added a flash bottom to the box with covered the foam insulation. Onto this false bottom we glued some tarot cards and a light-up, color-changing, LED crystal ball made from a plastic globe light shade and one of those LED bases used by florists on centerpieces. For a bit more fun and interactivity we wanted to add the Zoltar voice to the box. To do this we recorded an actual machine's voice we found on a youtube clip onto one of those little recording pucks often found in stuffed animals. This was attached to the from of the box and the play button was extended through the box using a small piece of Bic pen and a marble. Then we printed up hundreds of fortune cards which our daughter could feed out to people through a slot in the front of the machine. We've gotten really great reactions of this costume. At a few local festivals people have literally lined up in front of our daughter to push the button and receive their fortune! It's really a site to see.